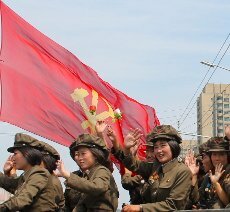 DPRK Travel - Anniversary of the Foundation of the Workers' Party of Korea. The application deadline for this tour is 12 September 2017. If interested in extending your tour please send us an e-mail stating how long you would like to extend for and if there are any specific places you would like to visit. Those entering by train leave Beijing a day earlier. Check our Youtube video below. Mass Dances are usually held on 10 October to mark the Anniversary of the Party's Foundation. Arch of Triumph - a gigantic structure that marks the return of President Kim Il Sung from his years abroad fighting the Japanese occupation. There is a gigantic mosaic mural too of Kim Il Sung's return speech. The Kim Il Sung Stadium is located close by. Kumsusan Palace of the Sun - Mausoleum of the Leaders Kim Il Sung and Kim Jong Il. The most sacred place in the DPRK and a highlight of any DPRK travel experience. Revolutionary Martyrs' Cemetery - situated on a hill in the outskirts of Pyongyang it has views of the whole skyline of Pyongyang. Depart to Kaesong - we head south towards the border between North and South Korea. The trip is 2.5 hours long and we will have a break by the highway where you can take pictures. If you go up the building you can take pictures of the empty Re-unification Highway. There are several military check-points on the way. Our guides will tell us when we cannot take pictures. After the stopping in the middle of the highway for a 10 minute break, it will eventually start getting dark. Driving on an empty, pitch-black highway towards one of the most sensitive borders in the world is indeed a surreal and unforgettable experience. As we take on this intriguing journey our local guides will tell us stories of life in the DPRK and how they view the country and the rest of the world. We will be explained too how the DPRK expects to reunify the Korean peninsula. Hotel check-in: Minsok Hotel - traditional courtyard Korean hotel located in the old part of town. Unlike other cities in Korea, Kaesong was not destroyed in the Korean War and conserves most of its original architecture. We will sleep and eat in a typical Korean manner; on a (heated) floor. You can try dog meat soup (€5 per person), ginseng chicken (€30 per chicken, which serves two people) or the food which is included in the tour fee which is equally tasty! Hotel Bar: We normally gather for drinks in a small, cozy bar located by the dining hall. Our Korean guides tend to join in and this is a great way to share impressions about what we have seen so far as well as to get to know the guides at a more personal level. As we enter Kaesong we can see the gigantic lit-up bronze statue of Kim Il Sung looming over the dark ancient city of Kaesong. As we look south, where Seoul lies barely 70 km away, we can see a strong contrast in the colour of the sky; skies full of stars in the North blending into an orangey pink colour the further south you look. Depart to Kaesong (Panmunjom, the DMZ) - This is less than 10 km away from Kaesong. 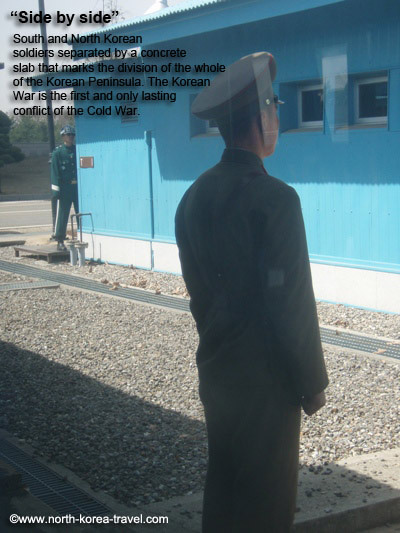 38th Parallel - chance to enter the famous blue negotiation rooms where talks between North & South Korea have taken place. This a DPRK travel highlight. Please note that if the negotiation rooms are not open because talks between North and South Korea have been stopped, then we will still be able to have a close-up view of the negotiation rooms. We will be escorted by a DPRK soldier, who will hop on to our coach, and be shown around Panmunjom, including the rooms where the Korean War Armistice was signed. As Korean soldiers tend to be curious about what Westerners think about the Korean War and about Korea in general, this will be a unique chance to interact with them and ask them any questions you may have. Lunch at Tongil Restaurant (Kaesong) - up to 12 small dishes served in covered-up golden plated bowls will be served to each person, each bowl being a surprise. As we exit Kaesong we will be able to see the train station that connects North and South Korea by rail (but which is currently not in use). At a distance too we will be able to see Kaesong Industrial Complex, which has made the headlines in Western media several times. 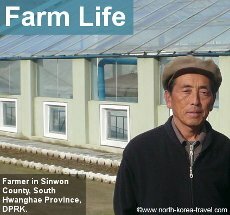 Drive to Sariwon City - lively city in the DPRK. We will have a stroll around its busiest street, Food Street, where we will be able to stop in one of the local "Suk Jib" (literally meaning wine house) where locals have Makoli (Korean rice wine). Great chance to absorb the local atmosphere. Migok Cooperative Farm - Cooperative farms were common in communist countries. Farmers work and live in the farm. 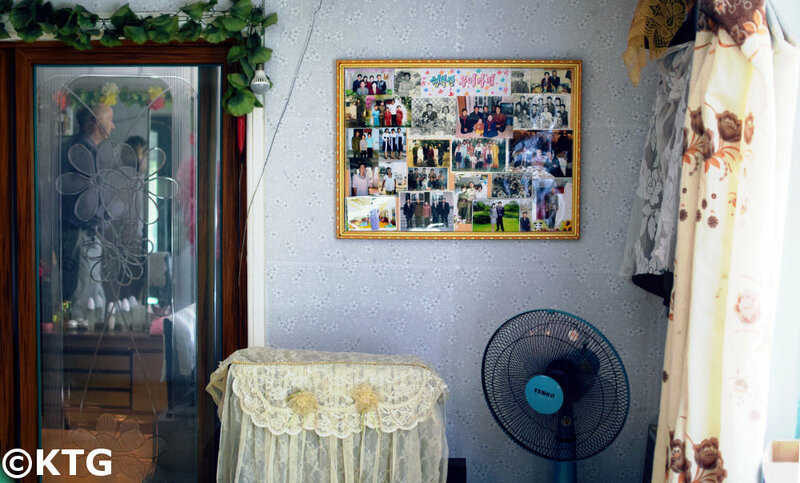 They have a cultural centre, schools for their children, their homes, etc in the farm. We will be able to explore around the farm, walk around the fields and visit a farmer's home and/or the children's school. Sariwon Folk Street - ocals normally play games here in the street and we will be more than welcome to join in! Option to walk up the local hill and have a panoramic view of the whole city of Sariwon. Please see our Youtube video above to have an idea of what it looks like! Stop by the Re-unfication Monuments) - great spot for some final pictures! Please check our 360° image of the 3 Charters Reunification Monument by clicking on the bubble! 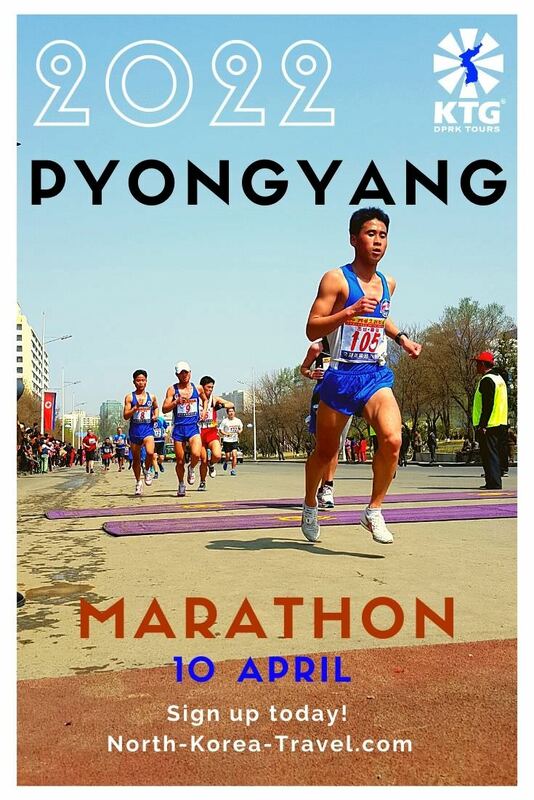 DPRK bookstore - chance to purchase DPRK newspapers (in English too), books in several languages, DVDs with subtitles, etc. Those not interested in going can check out the Austrian Coffee Shop which serves excellent imported coffee as well as desert. 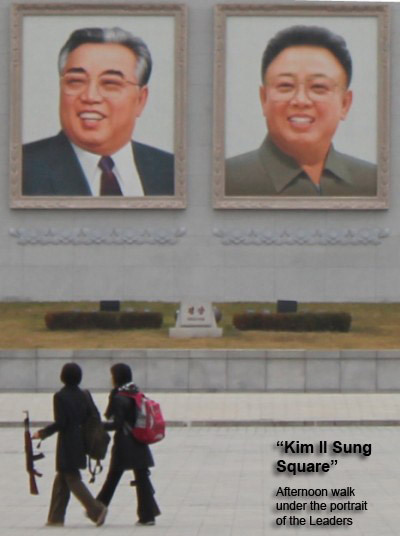 You can click on our Kim Il Sung Square link for more details. 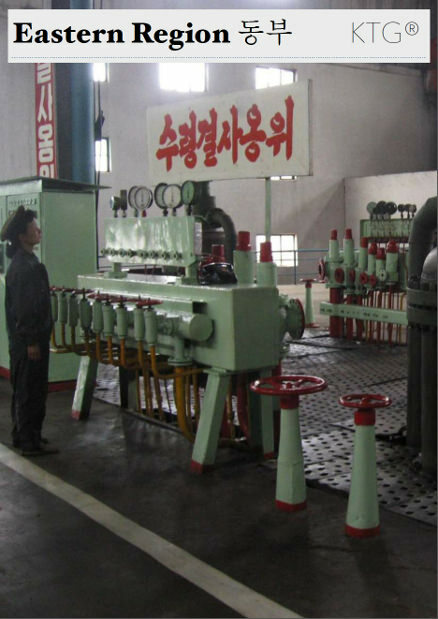 DPRK Film Studios - see where movies are produced in North Korea. If lucky we will be able to see a movie being produced. If not, we will still be able to walk around the sets. 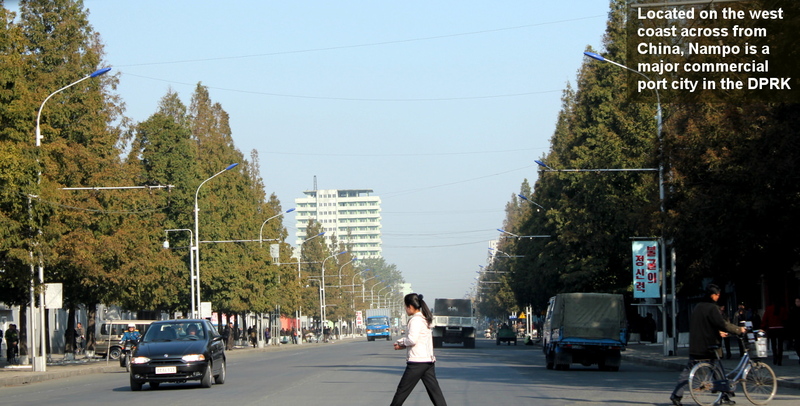 Pyongyang City Walk - walk around Changjon and Sungri streets. Drive to the west to the coastal city of Nampo - this We will drive on the empty lanes of the Youth Hero Highway. This was built by university students at the end of 90s, a period known as the "Arduous March" in the DPRK. Some of our Korean guides who we have been working together with for many years now help build this highway in their university days. It is always fascinating to hear what guides have to say about their own experiences and about life in North Korea through their eyes. This definitely helps us make the most out of the trip and having known the guides for several years after going to the DPRK so frequently has allowed us to enjoy a very close relationship with them. 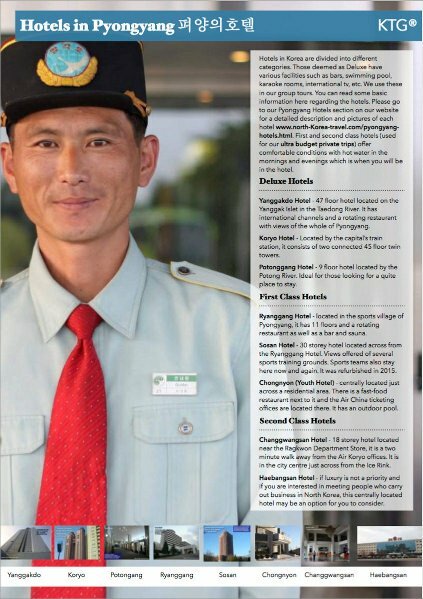 Having too small group tours to North Korea allows our travellers to have more of a personal relation with our guides. Many of our travellers send us messages and pictures for their guides that we pass on to them in our following visits to North Korea. West Sea-Barrage - 8 km structure which is used to separate the West Sea of Korea from the Taedong River and therefore reduces floods. We will have a view of the whole project from a hill. 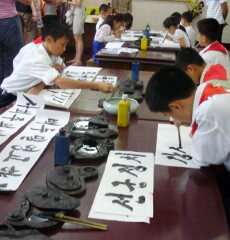 Nampo is a lively city with an increasing number of Chinese Korean JVs. Driving by the main port and the centre will allow you to see life in this major city. Views of Chollima Statue - the chollima Horse represents the official policy of the DPRK used in the years following the Korean War with the intention of rebuilding a nation from scratch. 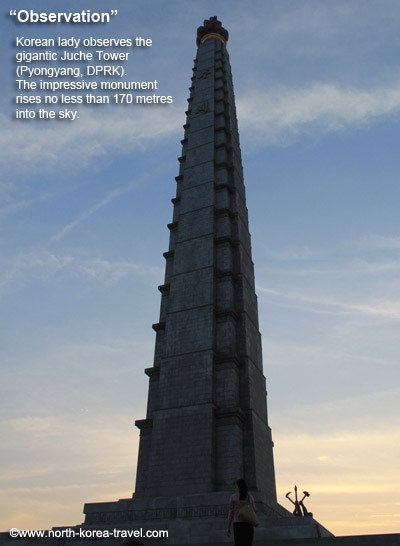 Juche Tower - you can go up 150 metres an have amazing views of the capital of North Korea. For those who would rather stay downstairs it is possible to have a brief walk by the river bed and see locals getting along with their holiday. Pyongyang Metro - take an extended ride with locals on a National Holiday. The metro is not just impressive because of its depth (on average over 100 metres) but also because of its absolutely stunningly beautiful decoration. The carriages that we will ride on are actually from the former GDR (East Germany). Moran Park - his is where locals gather on National Holidays. Don't be surprised if asked to join in any dancing and celebrations! Monument to the Workers' Party Foundation - celebration of the anniversary of the Party's Foundation. This monument consists of a 50 metre tall sickle, hammer and brush. Golden Lane Bowling Alley - chance of seeing locals spend a day off work having fun with friends. You can of course join in the fun! Local Funfair - we will go to to a new funfair. 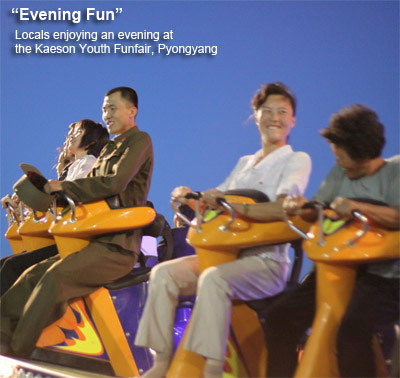 Even if you do not decide to go on any rides you are guaranteed to find this an experience and you may find people wanting to take pictures with you as the sight of foreigners is far from common in the DPRK. Rides vary from 1 to 5 Euros.